Partnerships: Chamber of Architects Ankara Brunch, Gönül Turgut Mentally Handicapped Kids Education Centre, sculptor Nevin Halis. Participants: 21 children( both handicapped and non-handicapped) aged 11-16, 6 students from faculty of architecture, 2 volunteer architects, 3 teachers from education centre. Goals/Aims: To meet with both handicapped (mentally and by vision) and un-handicapped children. To make children be aware of different kinds of lifestyle in city. 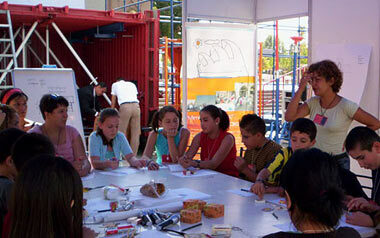 Methodology: To use drawing with hand- finger paint and to form the clay are expressing methods. 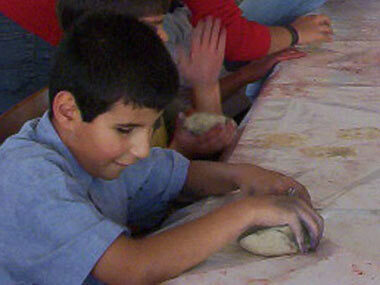 Clay is an easily formed material and children do not have much efforts while making finger paint. We use nourishmental colors on finger paint, so it doesn’t problem that any of children try to eat it. Drama is also used as a communication method. The workshop was planned to become 2 days. In these days, the handicapped children and normal ones met and work together. The question “who is the owner of the cities” was tried to be answered. The main questions are who lives in the cities and who the other is. It was a special experience for the children and also for us. This situation, being with handicapped children, was not familiar to our daily life but we managed to face it. The common senses were taste, touching and hearing. We had to find new forms to perceive. We have to create a new language. The words that we use freely in the daily life were meaningless. Because some of us doesn’t have as same knowledge as we have. So, the language was in metamorphosis. We have used the body language to overcome the difficulties among the children. We chose a city from Calvino’s Invisible Cities, called Sofronia. Two half cities make Sofronia. In one half, there are swings, circus, tents, ice-cream and balloon seller. In the other half, there are schools, factories, government building, and banks. One half is stable and the other half is mobile. All the children get roles from the pieces of the city. To become live, happy and active, the one half has to wait for the other half. For being the real Sofronia, the parts must be together. Where other part is questioned. We have to look for the other half to be a real city. Children used sounds for expressing happiness of being together and the silence of being separate. Parallely, they had to touched each other, these broke the ices. We wanted children to draw their city image in their own world. Finger painting method used for this work to make painting simple for the handicapped children. So, they are as free as the other children. While painting they make connections between each other, they explained what they are drawing. In the second day, the products that the children made were shared with citizens. With the help of the millions of stimulus circumstances, we all perceived living like them, realized that cities have some obstacles for some of us. It is important to give changes to be in a social area, to be in street together. Partnerships: Chamber of Architects Ankara Brunch, Building Information Centre, architect Yonca Al Hürol from East Mediterranean University. 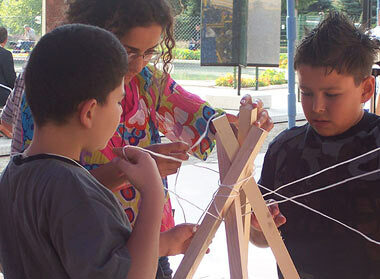 Participants: 12 children aged 11-14, 5 students from faculty of architecture, 3 volunteer architects. Goals/Aims: To make children gain the knowledge of ‘making’, and get an idea about concept of ‘structure’ and ‘construction’. 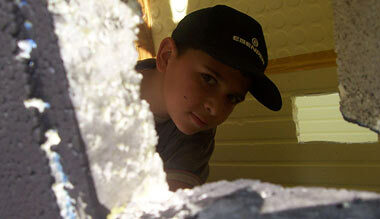 To make children discuss about the construction process. Methodology: To look for meaning of structure with the daily-life examples by collective thinking. To get knowledge about shelters that are not made by human being. To open the minds and increase creativity, trying to get shelters for sun and water. Making shelter for sun and water supported new experiments with different materials. 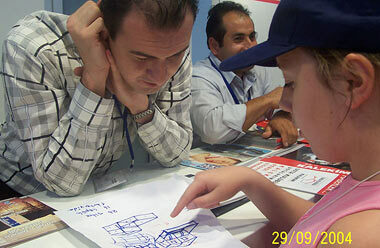 Being in a Construction Fair also gave chance to children to recognize the usage of materials by taking information from the company’s experts. Getting together and travelling to Fair Area. Everybody introduced themselves with describing their own room. Discussion about ‘shelter’, showing slates from different types of shelters. Looking for the answers, what the shelter is, what differences it has from house, who make shelter and so on. Get knowledge about the concept of structure by the help of slates and drawings. Making small models that will be the shelter for/in/over sun and water in groups. Children had to remember some questions while modelling. Those are; has the sun-shelter to be as big as sun? What do we catch under the sun shelter, sun or shadow? When we design a shelter for water, we protect water from what? For water-shelter, is it enough to collect the water? And many more. They used hand-lanterns as a sun-source, aluminium folio as a shell, wooden sticks, cord, and rope at models. At the end of the day, they chose places for the shelters and visit the companies to get the true material for their shelters. Making shelters. Exhibiting products and sharing with experts and visitors. Realizing that structure belongs to daily-life and shelters are formed according to necessity of which or what will use it. Finding new methods while communicating with adults, even children don’t have any knowledge about the subject.